[08:33:14] <bullzebub> hello ... i wonder about the "dapper" problems... is the problem in the install or the running of EMC? [08:34:40] <Lerneaen_Hydra> does it appear to be stable so far? [08:35:36] <Lerneaen_Hydra> oh, so it's in the apt-get script cradek made? [08:37:43] <Lerneaen_Hydra> alex_joni: how would I install only emc2 from head and not the stable branch, yet still get rt kernel? [08:38:21] <Lerneaen_Hydra> cradek's script and then apt-get remove emc-axis? [08:39:38] <Lerneaen_Hydra> oh, so I'll have two versions at once? that doesn't cause any issues? [08:40:19] <Lerneaen_Hydra> anything in particular I should test? [08:40:41] <alex_joni> please make notes if so..
[13:10:04] <alex_joni> cradek: when you have 20 minutes, can you redo the dapper repository? [14:02:21] <cradek> I envision using the nice Axis backplot/UI but having the large convincing coordinate display a la. tkemc in a vcp panel. [14:07:39] <cradek> wait, leather pants are cool? [14:39:21] <jepler> er, "big dro"
[15:04:23] <alex_joni> jepler: can you make a snapshot of that? [16:04:24] <alex_joni> anyone around who knows his way around sscanf ? [16:20:28] <SWPadnos> including the angle brackets? [16:20:45] <alex_joni> one char, one char, 6 chars that form a double? [16:20:48] <alex_joni> and so on..
[16:21:44] <SWPadnos> and it's a totally fixed-width format? [16:22:56] <SWPadnos> are the 6 characters for the float the hex representation of float data, or ASCII that's missing the decimal point? [16:25:22] <alex_joni> wanna look at the manual? [16:26:13] <SWPadnos> do you have sample data from it? [16:27:51] <SWPadnos> what mode are you using? [16:29:02] <SWPadnos> oops - "the above modes do this ..."
[16:30:43] <alex_joni> wonder if that would work ? [16:31:08] <alex_joni> is that OK? [16:32:49] <alex_joni> where do you have that from? [18:23:16] <cradek> I can't guess what they mean by "the result of the above calculation equals 1 character"
[22:04:00] <Lerneaen_Hydra> what is the format of the new table? [22:12:42] <Lerneaen_Hydra> cradek: do you need more clarification? [22:13:04] <cradek> is there a standard for how to specify the angles for each orientation? [22:14:10] <Lerneaen_Hydra> I have an image on the wiki. It's the format that my cam app uses, and it can (AFAICT) support all possible positions. 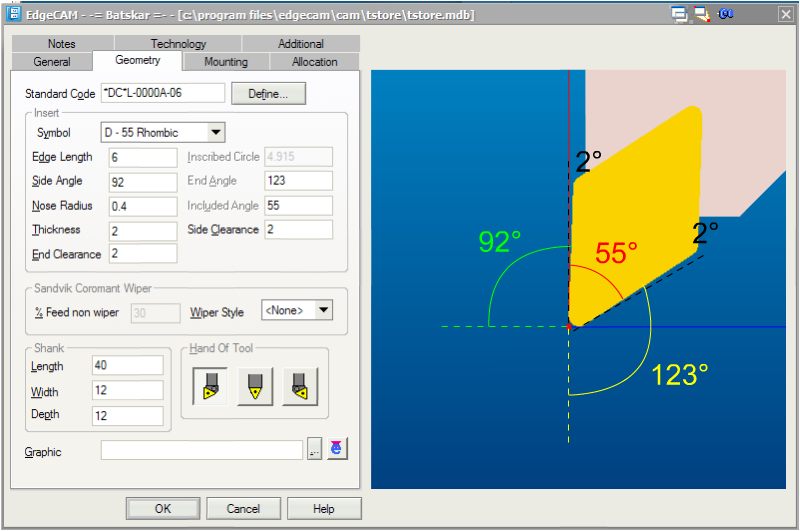 [22:15:49] <cradek> for a 60 degree threading tool, that would make the angle 60 and 120? [22:17:14] <Lerneaen_Hydra> uh, wouldn't that be 60 and 150? [22:21:34] <cradek> if you only have gouge protection on one side, is the 92 angle used for anything? [22:29:57] <Lerneaen_Hydra> so maybe a system where all angles are based from the -Y axis? [22:30:08] <Lerneaen_Hydra> like trailing edge is now, but also leading edge? [22:31:35] <Lerneaen_Hydra> what if the system only goes clockwise or counterclockwise? [22:31:58] <Lerneaen_Hydra> so a threading tool in your lathe would have 30 and 330?